Jimi Hendrix said this in his last interview, rather casually, with a smile on his lips. On September 11, 1970, the guitarist complained to the journalist Keith Abdul Hadi that everything had become so complicated and difficult in the meantime. As a result, he actually wanted to be like helium, that gas, which is seven times lighter than air. Only one week later, Hendrix flew away in fact, light like a helium balloon, into infinity. "This man really was a gas!!!!!! ", the singer Erika Stucky praised him almost 45 years later with the euphoric emphasis of six exclamation points, whereby the word "gas" can be understood as "fun" or "enjoyment" in this context. With guitarist Christy Doran, the drummer and percussionist Fredy Studer and e-bass legend Jamaladeen Tacuma, she continues construction of a monument in sound to Hendrix after precisely one decade. The three Swiss already laid a remarkable foundation for this in 2005 with their live CD "Jimi" (Double Moon Records DMR 71048), but still with Ms. Kim Clarke on bass at that time. "We absolutely wanted to make a studio recording. To that end, Erika, Fredy and I prepared ourselves for a year, met once a month, created ideas and tried things out," Christy Doran explained the motives for the ambitious project. In any case, the Swiss-American all-star band did not want to jazz up the master's work in a complicated fashion. "We are trying to communicate the spirit and the energy of his music with the experience of today's music," Doran emphasized. The result is an album that refreshingly rocks, but without falling into the usual superficial pattern of the genre. This is mainly due to the 7/8 and 5/4 times, the highly complex chords that Doran produces on the stratocaster, the virtuoso yet melodic bass playing of Ornette Coleman disciple Tacuma, which whisks away everything reminiscent of Noel Redding within a bar, as well as the nested, demoniacally haunting grooves of Studer, in which everything—true to the Hendrix motto—still sounds easy and comprehensible. "Fredy is a rhythm-eater," Erika Stucky stated in characterizing her co-musician. In addition to the Hendrix classics like "Hey Joe", "Gipsy Eyes", "Foxy Lady", "Machine Gun" and "Bold As Love", the fact that the four other pieces also interweave quotes from the flower-power period of the Beatles ("Sgt. Pepperʼs Lonely Hearts Club Band"), the musical "Hair" and Crosby, Stills & Nash, the forefathers of the singer-songwriter movement ("Teach Your Children"), is primarily due to the shrill, flamboyant vocalist. "I have to take the responsibility for that. I took in all these quotes so intensively that I am still exhaling them today. The reason is that I spent the first 10 years of my life in San Francisco. "Call Me Helium" was a return to my childhood when I wore all these colored clothes and tinkling-clinking bracelets. Jimi's lyrics spoke on a kids' level to me in those days: 'Let's take a ride on my dragonfly.' Oh, what kid would not like to fly on a dragonfly?" Although a lot sounds rather original here, everything is really different in principle. The crux of the resurgent Hendrix tribute lies in the attention to lovely details, in tiny fractures that can come lightly into this music in a completely different, individual world of experience, but which shifts them unmistakably. 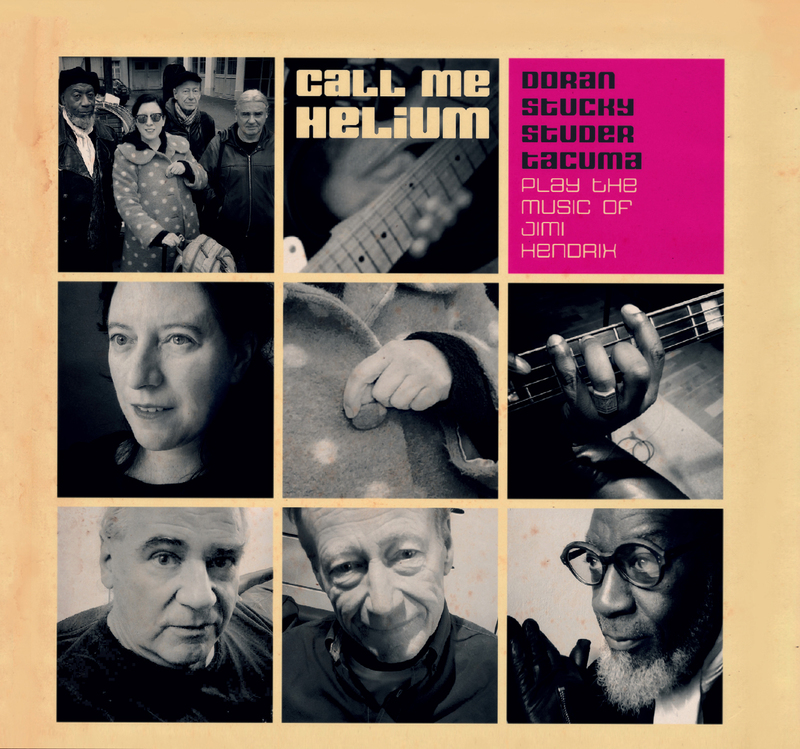 Whoever perceives "Call Me Helium" just as nostalgic trip back to the blessed Woodstock times overlooks the fact that Doran Stucky, Studer and Tacuma are basically paying homage to the visionary Jimi Hendrix. In their original way, they generate the spores of its diverse musical ideas at the interface between the big stage of pop and the dim cellar light of modern avant-garde.